Need a way to celebrate your Irishness? Or to celebrate your "Not Irish, But I Certainly Enjoy Their Company"-ness? 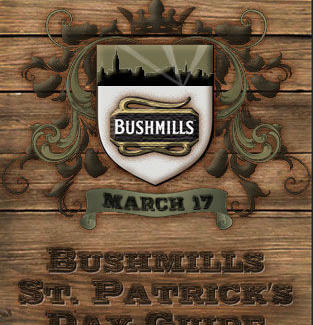 Then spend St. Patrick's with Bushmills Irish Whiskey: the extraordinarily smooth elixir first distilled over 400 years ago, and whose adventurous history since has included smugglers, transatlantic steamships, and the regrettable trauma of Prohibition, considered by Bushmills to be the worst idea since acid-wash jeans. To facilitate your day, check out this handy map of bars celebrating this most festive of holidays, all recommended heartily by Bushmills. Whether you hit McTeague's Saloon (an ode to turn-of-the-century NorCal, named for the gigantic gold-mining charlatan/dentist from local novelist Frank Norris' classic), The Irish Bank (overflowing with authentic-ness, from church pews to a 19th Century water pump) or the Blarney Stone (overflowing with authentic Irish-lady bartenders), you're guaranteed to have loads of good times, and absolutely no snakes. Or at least very few snakes.